The Americas were the original source for a number of familiar foods. He wrote "There is also plenty of 'ají', which is their pepper, which is more valuable than black pepper, and all the people eat nothing else, it being very wholesome." What an impact that these plants have had on our world! Without the genus Capsicum, food would be less interesting for sure. Columbus sailed in search of spices from the east, but what he returned with was a game-changer. In the 15th Century, spices were valued because a host's status was elevated by the number of flavors he could offer his guests. They were considered an international form of currency and were used to pay debts and were often included in dowries. Spices were also considered medicinal and apothecaries had detailed concoctions they prescribed to patients. It seems that cinnamon was even considered medicinal until the 1600's and not used as a flavoring until much later. The most valuable spice to the peoples of the Middle Ages was black pepper. It had a sharp bite and was coveted by the wealthy for its intense flavor. The sharp 'bite' of the coveted spice also masked the taste of meats and food that had begun to decay. Since refrigeration wasn't an option for Medieval people, they often depended on strong seasoning to counteract the 'off' taste. 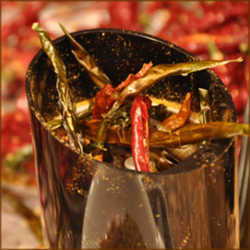 Black pepper was produced by grinding the dried seeds from Piper nigrum plant. The New World pepper comes from the Capsicum genus and is no way related, but since Columbus was determined to bring back eastern spices, he called it pepper and the name stuck. In some of the older writings, they used the term 'long pepper' to differentiate between the two. 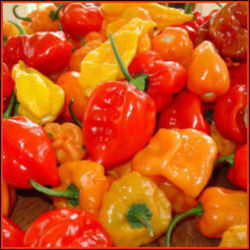 The Portuguese were ultimately responsible for spreading peppers throughout the world with their vast fleets of ships. The plants were easily adaptable to growing conditions just about everywhere and quickly gained popularity. Cross pollination was simple and new varieties quickly popped up. The world embraced New World pepper and in the last 500 years, its use has escalated to the point that it is a rival for salt. Many traditional dishes from all corners of the globe would be impossible to make without peppers. This ancient plant, domesticated in the Americas over 6,000 years ago (and used for over 9,000 years) is now available everywhere. 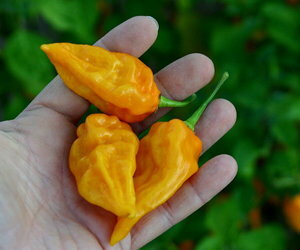 Sweet and hot varieties are common and available fresh, dried, pickled and frozen. They contain a significant amount of daily vitamin requirements and are loaded with cancer-fighting anti-oxidants. With all of the diversity available, there's a pepper for every taste. 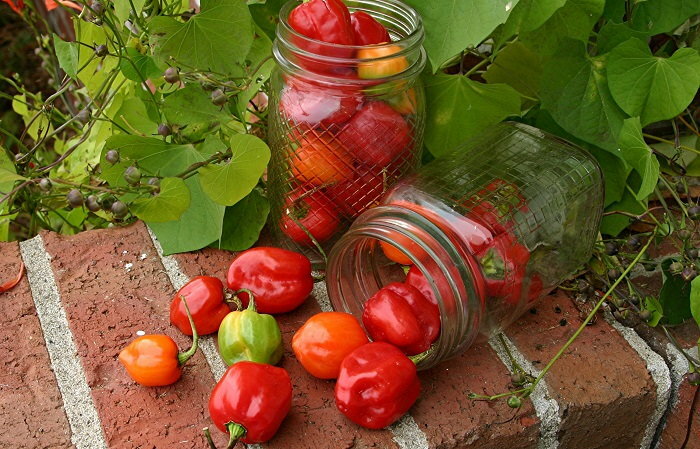 Growing peppers is easy and anyone with a sunny area (or balcony) can grow their own. Peppers adapt well to containers and are decorative as well as tasty. I keep several in containers by my kitchen door and it is a simple step or two to pick a couple for the evening meal. There are literally peppers in every color of the rainbow and most peppers go through several color changes before they are completely ripe. That's right, those green bell peppers in the supermarket are the same peppers as the red and yellow ones that command the higher prices. The growers can harvest several sets of green peppers from the same plant, while they can only harvest the ripe ones once, so each plant produces fewer peppers when they are allowed to ripen. Gardeners can start with seeds about 8 to 10 weeks before their last frost date. Plant the pepper seeds about ¼ inch deep in barely moist potting mix, lightly cover the soil with plastic wrap and place in a warm spot. Peppers do like warmth to germinate, so the top of a refrigerator or near a heat source is great. Ideal temperature is about 78 degrees F. (25.5 C) You should see the little plants emerging in about a week. Immediately remove the plastic wrap and move them to a sunny window or place them under fluorescent lights. Keep the soil moist, but not wet and your pepper plants should be ready to set out about 7 or 8 weeks later. There are also a vast variety of transplants available for those who prefer to avoid the seed starting step. Local nurseries usually have a number of favorites and there are mail order sources for those of you who wish for something more exotic. Peppers are self-fruitful, so there isn't any need for more than one plant. The flowers are complete, possessing both the male and female parts on the same blossom so they can pollinate themselves. If growing indoors, be sure to shake or vibrate your plant a couple of times a day to shake the pollen loose. 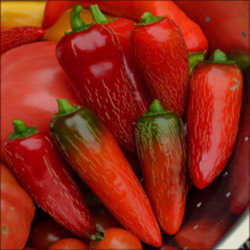 As you plant your veggie garden this season, be sure to check out the huge variety of peppers available. There's always room for an extra plant or two. Your garden will be colorful and your recipes extra tasty.